SPARK DIALOGUE: Taking discussion to another level. 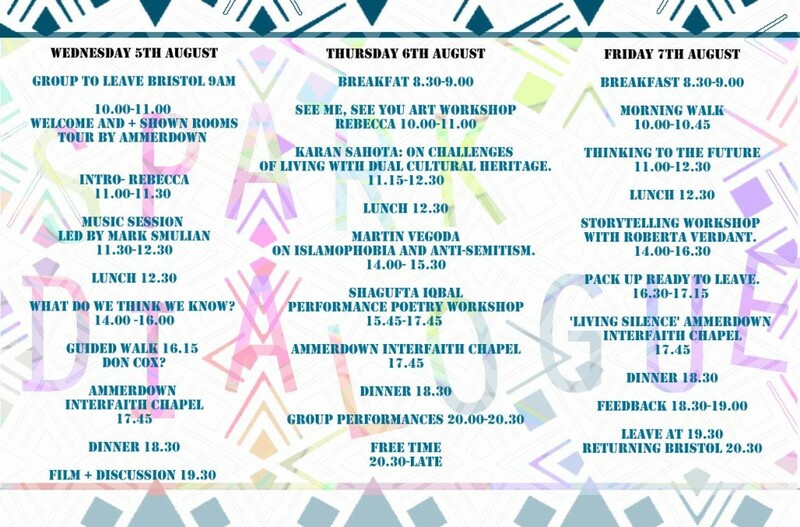 #creative #dialogue Join us for three days or just one. Intercultural identity, faith, culture, community, creativity, social change. Only £25 (Inclusive of transport and food= if you can’t afford this apply anyway we may be able to sponsor your place). Can’t make the full three days of Spark Dialogue? 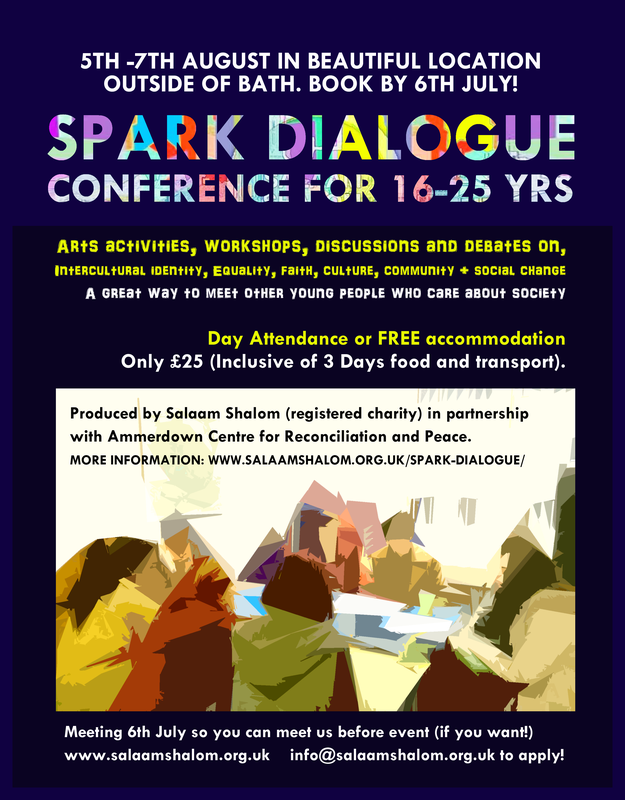 Join us for Thursday the 6th of August FREE places and return transport from Bristol to the Spark Dialogue conference in a beautiful location outside of Bath. Email us now at info@salaamshalom.org.uk to apply. (You must be 25 years or younger) We welcome participants from any community. DEADLINE 13th July. Session 1 See Me, See You -Art activity where you reflect personally about the different aspects of your identity and how you see yourself and how others might see you, trying to think through different elements of your identity for example family, nationality, education, gender, religion. You will create a self portrait decorated with words, followed by group discussion- where you can share as much or as little as you like! Karan Sahota shares her story, with the help of film clips and invites you to share your story too. Session 3 Islamophobia – antisemitism: complex words to describe a simple emotion: hatred of someone who I believe is different from me. Over centuries Muslims and Jews have been on the receiving end of prejudice. Why does this happen? How do you see this? Do you think people’s prejudicial attitudes can be countered and changed? An interactive workshop.